This is the most powerful evidence I've seen that Microsoft has been trounced by Apple. See the full story here. UPDATE: Here is a chart which makes the same point from a different perspective. 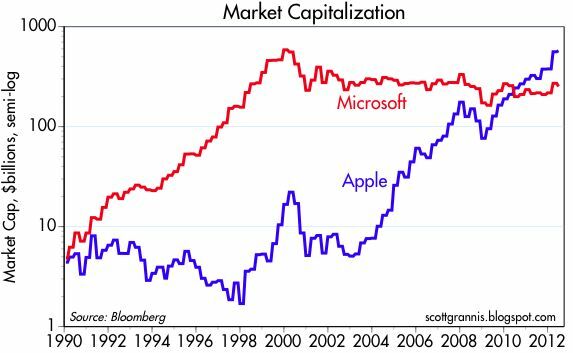 Apple's $574 billion market cap is now more than double Microsoft's. As one who still owns an Apple /// I am OK with the concept of Apple trouncing MSFT or anyone else. As one who uses Google Analytics to observe visitors to various websites, I wonder why Apple (Safari) never surpasses IE, Chrome, and Firefox? Sorry, I have to mention, these comparisons are just stupid. If you're going to compare non-PC devices, why is Windows Mobile phones and XBox-360's not included? What about Windows Servers? Or licenses for Windows on VMs. 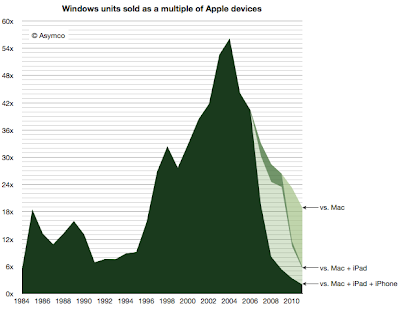 It's nice Apple closed the ground from 50:1 to 18:1 in the Desktop/Laptop space. That's good progress. But to say they are even by throwing in other devices Apple has excelled in and leaving out where Microsoft has excelled in is just silly. Granted Microsoft lost the phone market spectacularly, but you're really doing an unfair implying the PC market is dying. Not yet from what I see.